The City of San Luis Police Department completed a major and long awaited milestone with the completion of the 9-1-1 emergency system. In the past, the residents of San Luis who dialed 9-1-1 for emergencies were routed to the City of Somerton Police Department Communications Center which in return would transfer the call back to the San Luis PD which created crucial time to be lost during the transfer of the emergency call to our agency. This will no longer be the case to this recent communications upgrade. Now the San Luis Police Department and San Luis Fire Department will have information come directly from the SLPD Communications Center to be sent out to patrol officers and fire personnel. 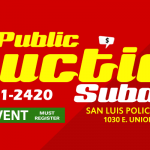 The City of San Luis Police Department will count with the adequate equipment to offer clear communication, immediate response and provide a better service to its residents. The upgraded 9-1-1 system now provides SLPD dispatchers with onscreen maps of the caller’s location and provides critical redundancy to the City’s emergency communications infrastructure to ensure delivery of the more than 10,000 emergency calls received each year and more than 34,000 calls for service. As always we like to remind the public to only call 9-1-1 for emergencies and for any other issues to call our non-emergency number 928-341-2420.